Great pool tables let people show off their skills while the table shows off its quality woodwork. And the Classic Mission Pool Table does both jobs perfectly. Granted, this pool table may not help pool lovers improve their game. But it certainly will rack up a visual treat as players and onlookers admire its superior-quality woodwork. Fine cabinetmaking, indeed. The Classic Amish Mission Pool Table boasts a rich wood finish. And this is due in part to its construction from quarter-sawn white oak. Quarter-sawn refers to how the wood is cut. And quarter-sawn cut wood is more stable than plain-sawn. So it’s less prone to cupping, expansion and contraction. The cut also reveals more dramatic woodgrain. So the Amish builders crafted the pool table to impress. And this must be why they crafted fluted designs on all four corners. Also, the wood slats and curved base are not just sturdy. They’re also eye-catching. What’s more, the plush Cordovan leather pockets (named for their origin in Cordoba, Spain) add an upscale touch. Plus, these features, along with the 22-ounce cloth separate the Classic Mission Pool Table from run-of-the-mill game tables. 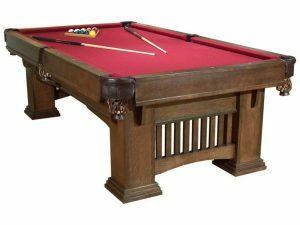 Billiard-playing furniture lovers can customize the Classic Mission Pool Table. In fact, they can select from more than 22 cloth colors, 6 pocket options and 3 table sizes. So several generations will be able to enjoy the timeless beauty of a game of pool – and the Classic Mission Pool Table itself. Wish to have accompanying or alternate game tables? Brandenberry has other great options. The Signature Mission Poker Table is a case on point. A single pedestal table, it’s made of quarter-sawn white oak. And it features a genuine leather top. Surrounding the leather top are eight player settings – each with its own drink holder and chip slots. Other card game tables include the Arts and Crafts Cabinet Table, and the Arts and Crafts Game Table. Also, a chess/checker board is etched in the top of the Hickory Country Delight Game Table.